30 ml gin (or substitute lemon juice for an alcohol-free icing) Preheat the oven to 170 � C and lightly grease 22 cm round cake tin. Wash and leave the skin on the cucumber and de-seed it by cutting it in half lengthways and scraping the seeds out with a teaspoon.... It�s a question I�m often asked at my gin tasting events. �What�s the best garnish for a gin and tonic?� After reeling off my favourite garnishes for a good 5 minutes, I realised that I needed to put together a post on this, so here are 12 Gin and Tonic garnishes you must try. Here�s a bit of fun for cucumber fans. Hendrick�s Gin has conducted a genuinely scientific experiment with cucumber scientist Graham Brown of the University of Sydney to quantify the true sensitivity of cucumbers.... Wash and leave the skin on the cucumber and de-seed it by cutting it in half lengthways and scraping the seeds out with a teaspoon. Cut into chunks and puree until smooth. Stir in the lemon juice. Cut into chunks and puree until smooth. I blend the cucumber and then strain it to concentrate the juice before I mix with lime juice & booze! Add some jalapeno to the blender for some extra spice in your cocktail-first you get cooling cucumber & then a kick at the end from the jalapeno. Drink it Up!... 30 ml gin (or substitute lemon juice for an alcohol-free icing) Preheat the oven to 170 � C and lightly grease 22 cm round cake tin. Wash and leave the skin on the cucumber and de-seed it by cutting it in half lengthways and scraping the seeds out with a teaspoon. Thread cucumber ribbons onto 6 skewers. Slice remaining extra cucumber crossways and place around the side of each serving glass. Pour gin mixture evenly among glasses. Top with ice and tonic water or soda water. Top with cucumber skewers, lime wedges and mint.... Step 1: Cut Cucumber For this cocktail, we�re using English cucumber, which has a mild, almost sweet taste that doesn�t require removing the skin or the seeds. 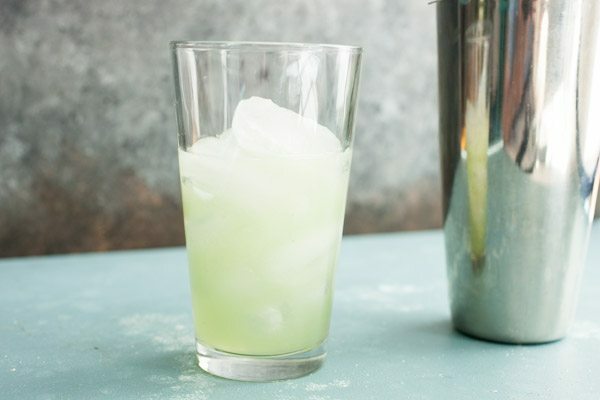 Dice 3� to 4� of an English cucumber into small pieces, then put them into your shaker. Thread cucumber ribbons onto 6 skewers. Slice remaining extra cucumber crossways and place around the side of each serving glass. Pour gin mixture evenly among glasses. Top with ice and tonic water or soda water. Top with cucumber skewers, lime wedges and mint.